Dean Claudine Gay convenes the inaugural symposium of the Inequality in America Initiative, which will include non-academic experiences and support a new postdoctoral fellowship. Dean of Social Science Claudine Gay last week launched a multiyear initiative on U.S. inequality while announcing a new postdoctoral fellowship to begin next fall. 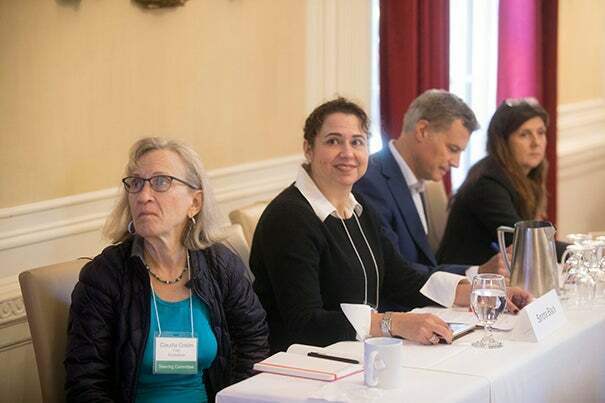 Putting “urgent, focused attention” on the complex problems surrounding economic growth, political stability, social trust, and public health, Gay convened a daylong symposium on Oct. 13 designed to inform scholarship and public debate. “With the people in this room, we have a real opportunity to turn the tide and make society work for everyone,” Smith added. Participants included academic leaders in economics, political science, psychology, sociology, history, and law. The morning session, “Work, Family & Opportunity,” featured Sandra Black of the University of Texas, Alan Krueger of Princeton, and Betsey Stevenson of the University of Michigan, all of whom served on the Obama administration’s Council of Economic Advisors. Krueger’s talk, “The Rigged Labor Market,” highlighted research of 340,000 employers showing how non-compete and no-poaching clauses are used to manipulate the job market. The cited businesses range from fast-food restaurants to auto-repair chains. The symposium ended with a panel called “Mobility and Migration/American Inequality, Globally,” which included discussion of social services for immigrants and the need for U.S. refugee resettlement programs to account for education and health care. Gay said that the Inequality in America Initiative will include symposia with non-academics who have front-line perspectives on the problem, and more research support. The postdoctoral training program will facilitate research across disciplines, with mentors within and beyond the fellow’s area of study. The deadline for 2018-19 applications is Jan. 16, 2018. “Entrepreneurship is a tool for providing something beneficial to society," said Steven Rogers, M.B.A. '85, who later spoke to a capacity crowd at the Ed Portal.